A high-tech NASA telescope in orbit escaped a potentially disastrous collision with a Soviet-era Russian spy satellite last year in a close call that highlights the growing threat of orbital debris around Earth. NASA's $690 million Fermi Gamma-ray Space Telescope — which studies the most powerful explosions in the universe — narrowly avoided a direct hit with the defunct 1.5-ton Russian reconnaissance satellite Cosmos 1805 on April 3, 2012, space agency officials announced Tuesday (April 30). The potential space collision was avoided when engineers commanded Fermi to fire its thrusters in a critical dodging maneuver to move out of harm's way. Fermi mission scientists first learned of the space collision threat on March 29, 2012 when they received a notice that the space telescope and Cosmos 1805 would miss each other by just 700 feet (213.4 meters). The mission team monitored the situation over the next day and it became clear that the two spacecraft, traveling in different orbits, would zip through the same point in space within 30 milliseconds of one another, NASA officials said. "My immediate reaction was, 'Whoa, this is different from anything we've seen before!'" NASA's Fermi project scientist Julie McEnery said in a statement. "It was clear we had to be ready to move Fermi out of the way, and that's when I alerted our Flight Dynamics Team that we were planning a maneuver," McEnery added. This NASA graphic depicts the amount of space junk currently orbiting Earth. The debris field is based on data from NASA's Orbital Debris Program Office. Image released on May 1, 2013. After making those calculations, scientists started planning to fire Fermi's thrusters specifically designed to move the satellite out of the way if these situations arise. "It's similar to forecasting rain at a specific time and place a week in advance," Eric Stoneking, the attitude control lead engineer for Fermi at NASA's Goddard Space Flight Center said of predicting these kinds of impacts in a statement. "As the date approaches, uncertainties in the prediction decrease and the initial picture may change dramatically." 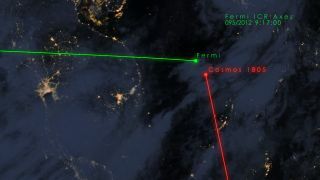 The two spacecraft ultimately missed each other by 6 miles (9 km) when they passed one another on April 3, 2012. "The maneuver, which was performed by the spacecraft itself based on procedures we developed a long time ago, was very simple, just firing all thrusters for one second," Stoneking said. "There was a lot of suspense and tension leading up to it, but once it was over, we just sighed with relief that it all went well." "A huge weight was lifted," McEnery said. "I felt like I'd lost 20 pounds." Space junk has been a growing threat to satellites and manned spacecraft in orbit, and collisions do occur from time to time. Last month, the European Space Agency held its sixth conference dedicated to combating the space junk threat in Darmstadt, Germany. In February 2009, another dead Russian satellite slammed into the U.S. communications satellite Iridium 33 in a space collision that spawned vast clouds of debris, one along each craft's orbit. In 2007, China intentionally destroyed a defunct weather satellite in an anti-satellite test. NASA tracks 17,000 objects larger than 4 inches (10 cm) across in orbit above the Earth every day. Only 7 percent of the objects tracked are currently active satellites. The Fermi telescope — launched in 2008 — searches the sky for signs of dark matter, black holes and spinning pulsars by seeking out sources of gamma-ray bursts, the brightest flashes of light in the universe since the Big Bang. Editor's Note: This story has been corrected to reflect the proper year of the space junk conjunction. The near miss occured in 2012, not 2013.